The purpose of the proposed channel is to allow larger power boats to traverse the river from Grand Rapids to Lake Michigan. I wrote briefly on the proposal in October, and since that time my ambivalence has evolved into opposition. A well-written MLive story containing Mr. Nash’s quote and other information can be found here; writer Brian McVicker is to be commended for a thorough and balanced piece. The Grand will never return to its pristine original state, but that doesn’t keep me up at night. I love watching the freighters split the piers in Grand Haven, an activity made possible only because, long ago, humans intervened and have maintained that interference for more than a century. Similarly, I don’t like dams on the Grand and am heartened by the recent trend to remove them, but I like the fact that the 6th St dam in Grand Rapids prevents lampreys from getting any further up the river. Weighing the pros and cons of human intervention in nature is not always a simple task. Our first obligation, however, should be to do no further harm to the Grand while she slowly continues to recover from centuries of neglect and active degradation. Local politicians and Chamber of Commerce-types often strike at the promise of economic development or increased tourism like a hungry bass hitting a Hula Popper on one of the Grand’s peaceful bayous. Before striking the lure, however, we ought to slow down and examine the costs. In the case of dredging the Grand those costs might include stirring up contaminants that have been buried for decades or destroying little-understood fish and wildlife habitats. Proponents point to the prospect of economic development and increased tourism, dangling visions of new marinas and riverside restaurants springing up along the banks of the proposed channel. We even have the mayor of one community along the proposed channel – Steve Maas of Grandville – acting as an advisor to the developer of the project, leaving me to wonder how he can both judge the proposal on its merits and act as an advisor to the developer at the same time. So the Spring Lake Township Supervisor is correct; the focus should be on the river. Not on what’s best for business. Not on what will create jobs or expand the local tax base. The focus should be on the river. What’s the best way to make the Grand accessible and enjoyable to the citizens of Michigan in an environmentally-responsible, cost-efficient manner? In January I also wrote about great improvements along the Grand in the form of newly-opened Ottawa Sands County Park. 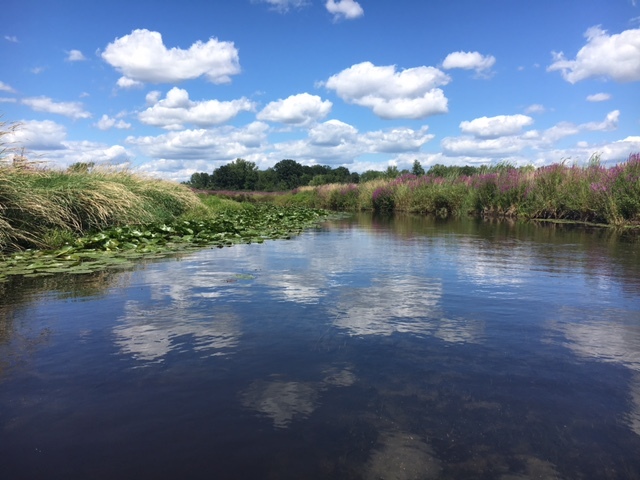 Ottawa Sands allows residents to increase their enjoyment and use of the Grand River without increasing the demand on the river’s resources, a far better path forward than dredging a potentially-disastrous channel. So I’ll sign off now the same way I often do, by urging readers to take the river’s side and keep in mind that Industry and Big Agriculture have plenty of friends in high places already. Thank you for visiting our site. If you enjoyed our blog, please share it with a friend or on social media. Links to this blog are always posted at Length of the Grand on Facebook; please follow us there as well. You may leave comments here or contact us as follows: joe@lengthofthegrand.com (Joe Neely); and/or, tom@lengthofthegrand.com (Tom Neely). We look forward to resuming our paddling – likely in June, Joe and his wife are moving in May – and finishing our quest to paddle the entire length of the Grand by mid-summer. Our adventure is just about the perfect size for me. I decided this after attending the Quiet Water Symposium in East Lansing yesterday. At the symposium I met a nice couple who paddled from the headwaters of their local river in Ohio, across Indiana into the Ohio River, and from there down the Mississippi River to the Gulf of Mexico. I talked with another man who was the fourth person to hike the entire length of the North Country Scenic Trail, 4600 miles from BFE North Dakota to BFE Vermont. I listened to a presentation from a guy who was about my age but a lot braver. He guides river trips and survives run-ins with grizzly bears in the far northern wilderness . . . that’s far northern as in above the Arctic Circle, not as in Traverse City Cherry Festival. These are magnificent adventures worthy of the books they all wrote and the rapt attention of the audiences they addressed at the QWS. Our friend Dave was also at the QWS. He attended a talk on ‘pushing the boundaries of solo camping’ and for some reason thought I, too, might be interested in that topic. Did I mention that Dave, like the river guide, is also braver than I am? The speaker was talking about wilderness water purification systems when I entered the room, and that’s a boundary I don’t care to push. I’m not drinking Grand River water unless it has been treated 10-ways-to-Sunday by someone I can sue for millions of dollars if I get sick. So here we are, my brother and I, a couple of old codgers if ever there were such a thing. We are paddling the length of Michigan’s longest river and taking our time about it. We hope to finish this summer but if something comes up, well, whatcha’ gonna do? There’s always next year. Paddle the mighty Mississippi? Hike and hike and hike the North Country Trail? Stare down grizzlies and stretch the boundaries of wilderness camping? No thanks. I’m 64 years old and have a bum knee which would probably improve if I lost the weight I’ve regained recently. I wake up two or three times a night to use the bathroom and take Aleve most days to keep my arthritis in check. Set aside the physical difficulties and the fact remains that these trips would take me away from home for extended periods. I would miss my wife, my grandkids, farmers market produce and free-range eggs. And naps. I love an occasional nap. My brother and I don’t camp, eat dehydrated food, have near-misses with dangerous wildlife or get devoured by mosquitos and blackflies. We don’t walk until our blistered toes are bleeding, but one of us almost always gets a blister on the first day of paddling season – right between the thumb and index finger – and we carry a first aid kit because we might cut ourselves while opening a can of peaches at lunch. We claim the blue heron as our spirit guide, marvel at bald eagles near Portland, keep track of the different-colored dragon flies we encounter and sing our favorite songs aloud. Most importantly, we paddle the river of our youth with the wisdom of our age. We just putz along, but with maturity comes the realization that putzing along can be a wise and entirely satisfying course of action. Thank you for visiting our blog. If you enjoy your visit, please tell a friend. Our blog entries are always linked to our Facebook page at Length Of The Grand please share our blog there as well. You may contact us by leaving a message here or by email: joe@lengthofthegrand.com or tom@lengthofthegrand.com . Always take the river’s side: Industry and Big Agriculture have plenty of friends in high places. She used to steal stuff. She went through a phase, maybe twenty or fifteen years ago, when she used to grab packets of condiments from every restaurant. Packets of salt, pepper, relish, mayonnaise, ketchup, sugar, butter, crackers, coffee creamer, Arby’s sauce… whatever she could get. She carried them around in her purse. She thought she was very clever to keep this stash. I do not know why she did it. Just in case? In case of nuclear attack, she would have Heinz ketchup and non-dairy creamer? I never saw her use any of this stuff. She and I made sandwiches over the years, but she never pulled out mayonnaise or pepper from her purse for our sandwiches. When she died last year there were no condiments, no packets of any kind of food left in her purse. It was a green leather purse. I went through it myself, after she died. I wonder whether she might have eaten all those packets, licked them all up, grinning, late at night, when nobody was around, during her final years. Lord knows. Or, maybe she donated them to charity. I am sure the Lord forgives this sort of thing. Not guilty by reason of absurdity.